We were asked to select our favourite palette from a list of two for our inspiration. The amazing palettes were created by the amazing Brandi of BrandiGirlBlog. 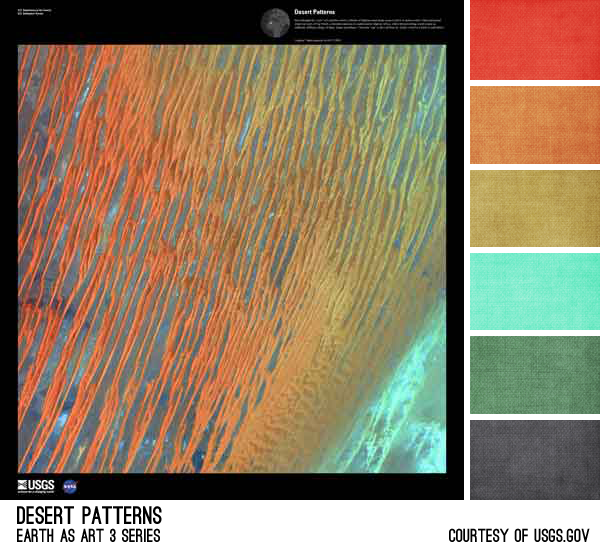 The pictures she worked with to make the palettes are from the Earth as Art exhibit from the United States Geological Service taken from the Landsat 7 satellite. When I heard NASA, colour and art in the same sentence, I was in. The palette I chose is called Desert Patterns. Seen through the “eyes” of a satellite sensor, ribbons of Saharan sand dunes seem to glow in sunset colors. These patterned stripes are part of Erg Chech, a desolate sand sea in southwestern Algeria, Africa, where the prevailing winds create an endlessly shifting collage of large, linear sand dunes. The term “erg” is derived from an Arabic word for a field of sand dunes. I was immediately drawn to the colours, they are right up my alley. But, I was also actually very inspired by the photo itself. By the textures and ripples in the sand dunes. I really wanted to create something with layers and dimension. And of course, colour! I also wanted to suggest movement in the piece. I didn’t want it to be too literal, just implied. To do this, I went with some fold-forming and patinas. I fold-formed some Copper first to create some layers and crevices for texture and dimension. I also cut my focal into a sort of wave shape, to suggest movement. Then I went to town with my patinas to add in all of my wonderful colours. And I continued with colour in the necklace strap. 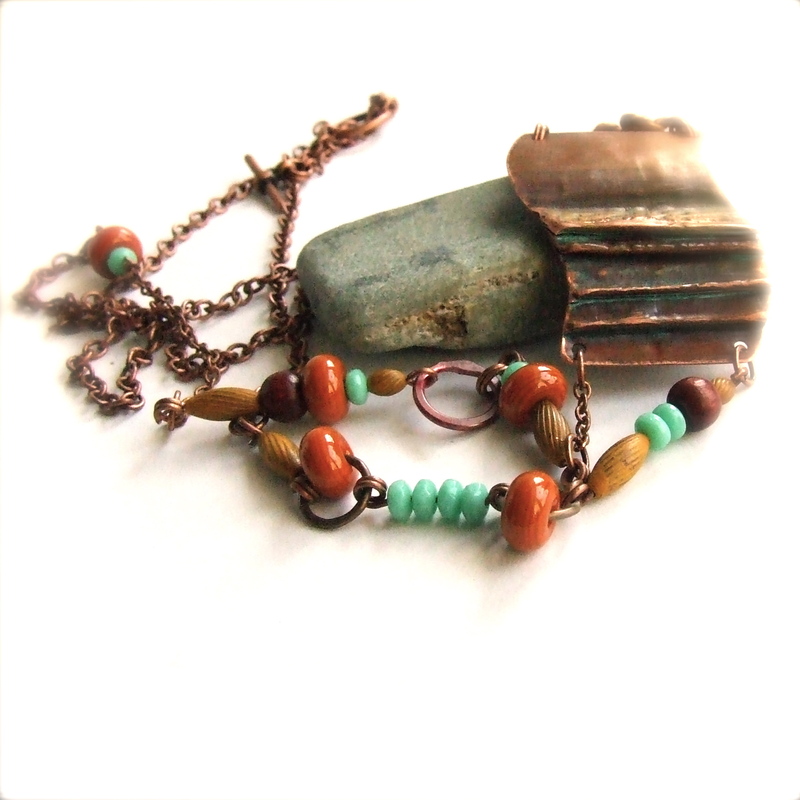 Here there are handmade glass beads in that amazing rust orange colour, my own patinaed beads and chain in the lovely mustard ochre, some stained wood to represent that wonderful tomato red and some simple faceted glass beads in turquoise. This project was so enjoyable for me. My sincere thanks to Erin and Brandi for all their hard work on this! For a full list of all participants, please follow this link. Love this piece – so well thought out and the fold forming with patina is just gorgeous. Dang you! Fold forming! Oh my you have created such a wonderful piece….and you colors are so beautiful! My blog reading list is growing and growing today! Great use of texture. Like the folded copper lots. Weren’t the Challenge of Color palettes just beautiful? I was so happy with the ones I got. You made such a gorgeous piece with yours! You did a fantastic job on this challenge! the palettes were all amazing! thank you, Aimee! Spot on! Love the metal pendant. I love the folded copper! Such great texture and form. The whole piece has such a great feel. All of the palettes have been so beautiful! 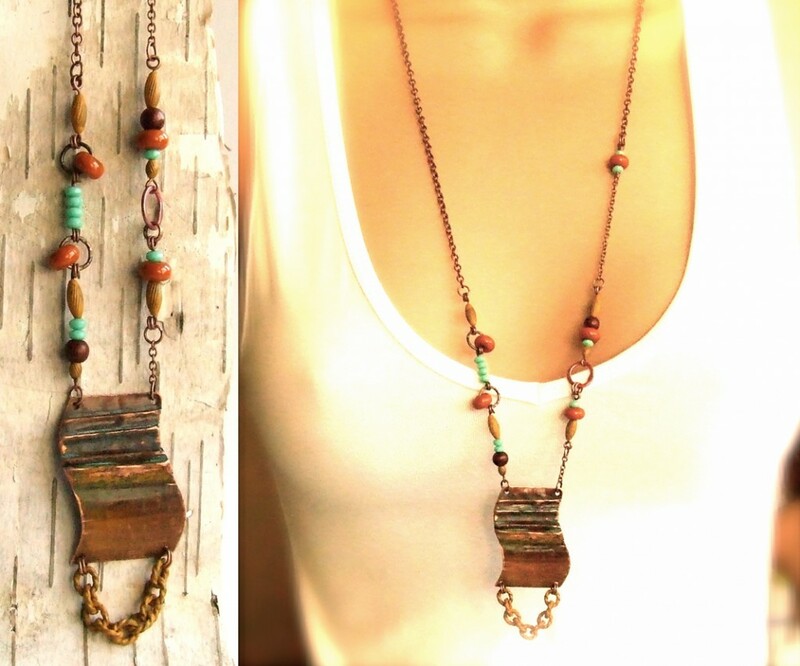 Very nice design…love the copper pendant! Beautiful color palette! Well, this late in the day, I’m running out of adjectives! I really like what you made, and it invokes your palette in more than one way – color, texture, mood. I love your color palette choice, and your necklace is stunnig! thanks so much, everyone! this was so much fun! Wow! I absolutely love that fold-formed focal!! This is an amazing interpretaion— the colors and textures are spot on! I can almost see the desert winds creating folds in the sand! Beautiful! How gorgeous is that! I love the fold-forming to represent the sand dunes. Great idea and execution of it. 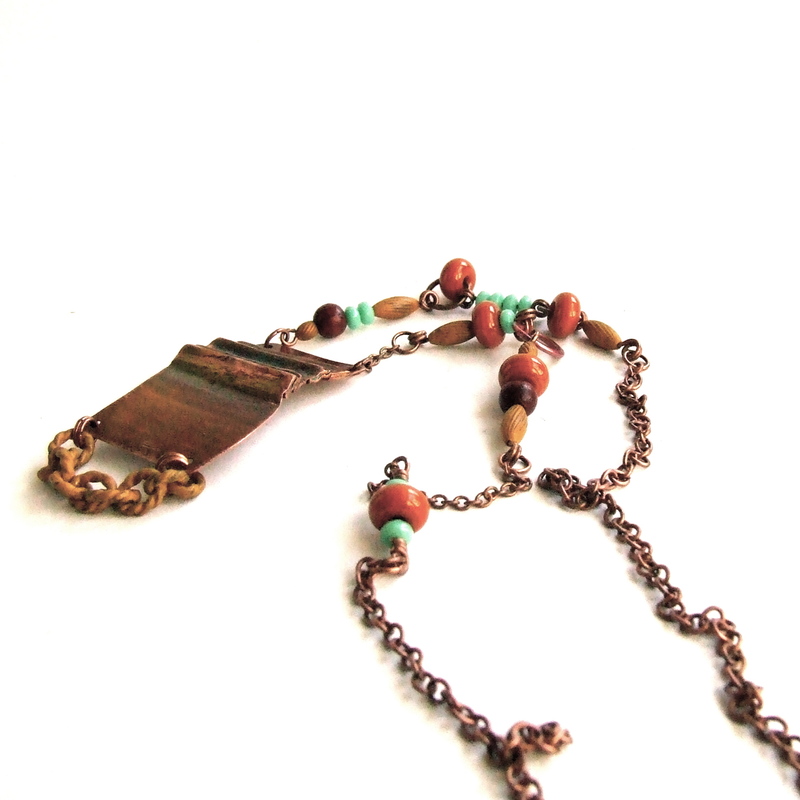 The colors of the beads go so well with the copper too. That is one stunning necklace! Love the texture and the color and…oh just about everything! Wow .. that necklace is certainly stunning! I love your focal and the bit of chain at the bottom is a great touch. The beads you chose are perfect and the whole thing is just a treat for the eyes. Oh man! 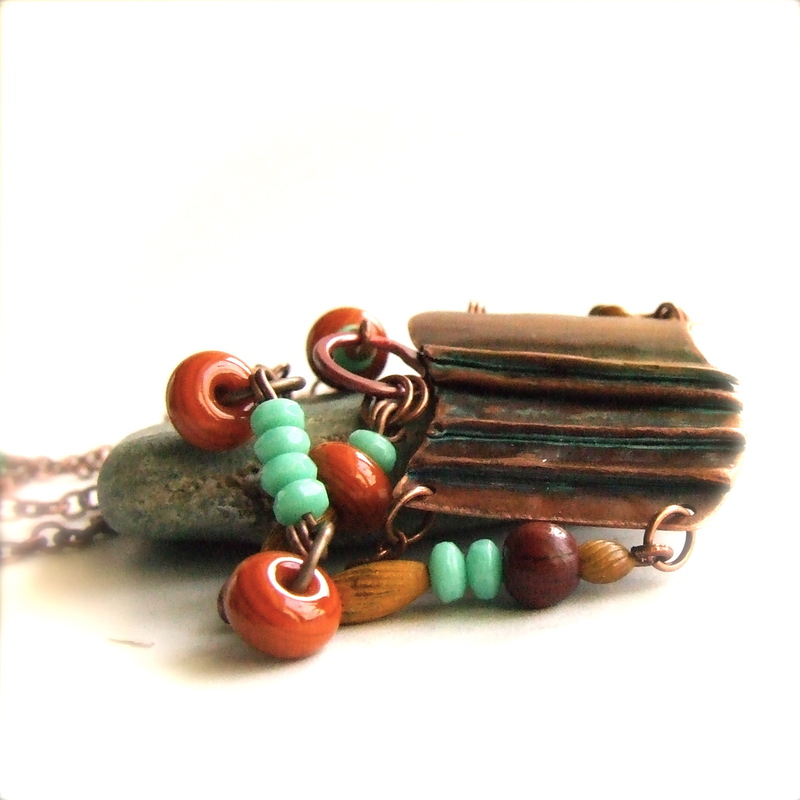 ‘Love that copper focal and how the lines in it echo the dessert dunes! The accent beads are just perfect, too! Your piece not only fits the color but also the mood and spirit of the pic. Fantastic job. Friend, ohmigosh, your necklace is STUNNING! I love everything about it – the folded copper, the patinas, the shapes, the textures. The colors are spot-on, and it absolutely brings to mind the lines in the photo. So amazing! Thank you so much, Brandi! Your palettes were all amazing! This was so much fun. Wow, what an outstanding piece! Those are some of my very favorite colors, but I also love the fold formed copper – something I haven’t tried yet. Just love it! Your folded copper piece is fabulous, love how it is representative of your palette picture. Fantastic interpretation of the challenge. Not only did you nail the color scheme, you got the texture as well. Bravo! That’s a really lovely necklace. Way to go! The pendant is exquisite…you were spot-on in your interpretation of the crevices and folds of your palette’s landscape. I am so impressed! What a great piece. I love the foldforming. I’ve only done it once, but had a blast and am anxious to do more. Your piece inspired me to get busy with it. Love it. Aw, Erin, thank you!! This was such an enjoyable challenge for me, I enjoyed the process so much. Thank you to you and Brandi for organising this! Wow, I’m nearly speachless at the wonderful design and the gorgeous colors you used in this fabulous piece! 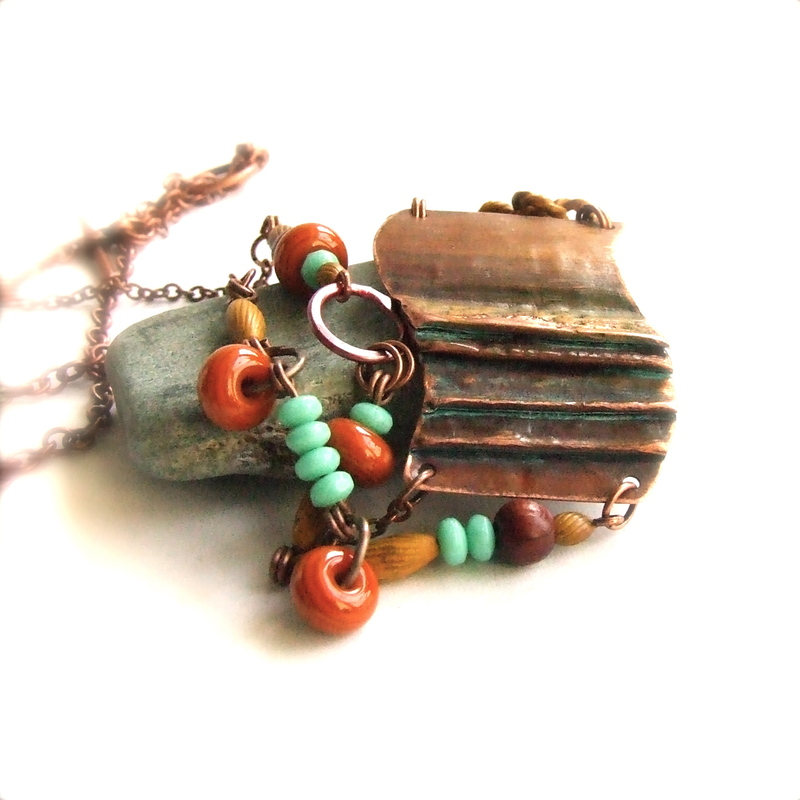 I love the fold formed pendant, and the colorful beads really show it off nicely. The necklace represents the palette perfectly!